In more diplomatic terms, the AP report essentially says that Hekmatyar’s offer–to drop preconditions–is a bid to stay relevant. Hekmatyar, at several points in the past, has settled with his enemies for political position. For example, following the collapse of the Communist government of Mohammad Najibullah all the major anti-Soviet mujahedin groups signed the Peshawar Accords in April 1992, except for Hekmatyar. The accords set up a path forward and established an interim government, which Hekmatyar was left out of. Almost immediately his forces began attacking Kabul. By the end of May, the interim government negotiated Hekmatyar into the post of prime minister but a week later the deal was off again after interim President Sibghatullah Mujaddidi plane came under rocket fire. Mujaddidi claimed Hekmatyar’s forces were responsible. By June, Hizb-i-Islami was shelling Kabul again. In late 1993, another agreement brought Hekmatyar into the government of President Burhanuddin Rabbani. Again, this settlement didn’t last long. By January 1994, Hekmatyar shifted to join with Abdul Rashid Dostum in opposition to the Rabbani government. The infighting continued. By 1996, Hekmatyar had joined with Rabbani and was made prime minister, but the interim government collapsed for all intents and purposes and fled north, becoming the Northern Alliance when the Taliban, formed in 1994, rolled into Kabul. Hekmatyar fled to Iran in 1997, but more recent accounts put him in Pakistan at last sighting. Hizb-i-Islami, meanwhile, has dwindled since the civil war years. 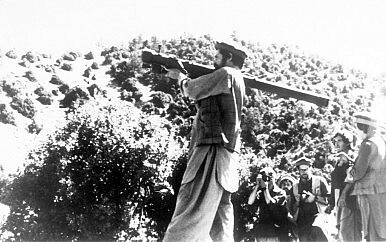 Hekmatyar’s group opposed the American-led invasion, but has never been as prominent as the Taliban. A 2008 article in the Washington Post cited ISAF estimates that there were 1,000 militants in the party. Though far from a complete comparison, consider the number of attacks attributed to the party registered in the open-source Global Terrorism Database. Hezb-i-Islami’s entry pulls 52 “incidents,” while the Taliban generate 4,279 (through 2014). With all this in mind, the news that Hekmatyar is willing to negotiate is nice to hear, but should be taken with several grains of salt. Not only have Hekmatyar’s agreements fizzled repeatedly in the past, but the impact–on the battlefields of Afghanistan–of his group laying down arms would be minimal. Hizb-i-Islami's pre-conditions are back: peace negotiations reportedly suspended over demands that foreign troops depart.